If you would like this piece with your personal touch, please enter your details here. This Piece measures 52" wide, top shelf is approx. 50" wide. Total height to top is 78". The counter depth is 20", inside depth is 15.5" with counter top height at 36". Top, and frame are solid Maple Ash or Pine in espresso, topped with poly. Back is chalkboard, with black iron shelf support, and cup hooks which can be easily removed if needed. Two front doors are cross buck and slide to the middle. All hardware is painted black. Please allow approx 10 - 12 weeks for shipping. This piece ships free. If you would like slight modifications, please inquire. In most cases my pieces will ship well within the time frame posted. In cases where I have high volumes I may need the full listed time frame. Each one of my pieces are custom made and may very slightly from the picture due to wood grain features etc. We received the coffee bar last week and my family is beyond happy with this piece. The quality is superb and the bar is beautiful. The piece has ample space for everything and fits perfectly in with our country/rustic decor. 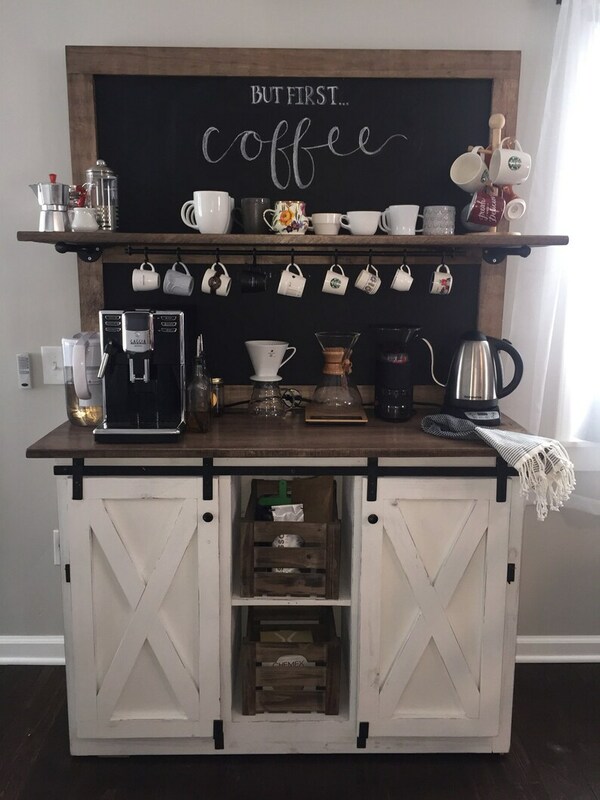 My teenage son has been taking woodworking classes with our church’s homeschool group and is very impressed with the workmanship of the coffee bar as well as the level of quality work that went into the crate in which it was shipped to us. As he and my husband were un-crating the coffee bar, they both commented on how impressed they were. Anthony, the builder of this piece was pleasant to work with and answered all of my questions and was timely in his responses. I highly recommend this coffee bar as well as any other products Anthony makes. This piece was EXACTLY what I was looking for! Superb craftsmanship and design - we are so pleased with the overall look. Thanks, Anthony! I am in love with my new coffee bar! Even though it took almost 5 months to receive it, Anthony was great at responding to my endless questions and emails...it was wrapped with great care for shipping too...I would recommend Anthony and this shop to anyone! Could not be happier with this coffee bar. We had company stay with us right after we received it and they couldn't stop talking about it. It is the center piece of our kitchen. Fantastic quality!! It was delivered in person by the seller which is very rare.